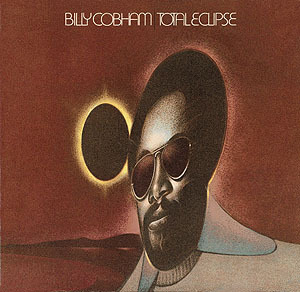 This, the third solo album from Billy Cobham in less than two years, shows the gifted drummer taking his music even further back into his jazz roots and continuing to distance himself from the rock mentality that so influenced the first and, to a lesser extent, the second LP. It's just as well because I don't think he could have ever matched the genius of "Spectrum." (As it is, all of his subsequent albums ended up being compared to that masterpiece, anyway.) But "Total Eclipse" still entertains, mainly because of the caliber of fine musicians that contribute their admirable skills to the project. As he did on "Crosswinds," Billy opens the album with a suite of different musical ideas strung together. This one is called "Solarization" and the opening segment of the same title has a rousing, frantic beginning featuring a tight horn section with sizzling electric guitar. Guitarist John Abercrombie will never fill Tommy Bolin's sizable shoes in Cobham's band but he turns in a pretty fierce lead here that is hard to overlook. "Second Phase" is basically some avant garde solo acoustic piano noodlings from Milcho Leviev that lead directly into "Crescent Sun," a smooth contemporary jazz number that features Glenn Ferris playing some excellent trombone. "Voyage" is a return to the earlier frenetic pace as Randy Brecker's trumpet, Billy's hot drumming and John's guitar take turns trying to top each other. "Solarization - Recapitulation" is a brief return to the original theme. Taken as a whole the entire suite is exciting in places but not particularly memorable when all is said and done. "Lunarputians" reveals what really happened to Billy Cobham. He, like many others in that era, was seduced by the FUNK. This tune is pure James Brown in its feel from the get-go and it never lets up for a moment. I call it complex soul music and Ferris' expressive trombone gives it a real kick in the tail. One of the things I really enjoy about Cobham's music is his ability to create remarkable melodies and "Total Eclipse" has the best one on this album. It's standard MOR urban jazz but it has an infectious "walking" groove that will get your foot tapping in time. Leviev throws down an exemplary acoustic piano ride then, after a clever horn section breakdown, Mike Brecker steps up and delivers a searing soprano sax lead. Abercrombie's guitar solo gets a little too intense for the welfare of this tune toward the end, however, and he siphons off some of the momentum. I appreciate the lightning tempo of "Bandits" but it sounds like something Billy and bassist Alex Blake came up with one session when the other musicians were AWOL because, other than some small contributions from John, it's just the rhythm section running wild. Blake plays a lot like Stanley Clarke (except that he doesn't generate the cool tone that Stanley does) and Cobham takes a few bars for himself, showing that he is, indeed, a drummer foremost. "Moon Germs" is basically a dance song that allows guest guitarist Cornell Dupree to add his veteran two cents worth before letting Mike Brecker clear the room with a blistering tenor sax solo. I'm not a huge fan of John Abercrombie's style and I'll tell you why. Here his brittle tone borders on annoying and there's really no excuse for it. 'Nuff said. "The Moon Ain't Made of Green Cheese" is next and it's a welcome but too brief change of mood in which Cobham performs on acoustic piano accompanied by Randy Brecker's delicate horn. Very nice piece. "Sea of Tranquility" is a brave, adventurous tune with an involved, intricate modern jazz melody that allows Mike, Milcho and John to stretch out a bit and fully demonstrate their individual virtuosity. A spacey intro on the Rhodes electric piano sets you up for a short flourish from the horn section followed by a four-minute drum solo on the closer, "Last Frontier." Billy's lone chording on the acoustic piano takes things out on a serene note. While there's actually nothing to complain about, there's also very little to go totally nuts over, either. Many of the numbers are glorified jams and, while there's nothing inherently wrong with that approach at all, it makes it much less progressive in nature. Billy's lightning quick hands and feet are still as amazing as they ever were with Mahavishnu Orchestra but I get the sense that he was beginning to deplete his storehouse of song ideas about that time and bringing in the best players he could find was a smart alternative. It's good music, to be sure, but in the jazz world an album has to be extraordinary to rise above the norm. This one doesn't. 3.1 stars.